Adele at BBC Radio 2 on October 23, 2015 in London, England. Adele's "Hello" has become the first song to sell one million tracks in a week. 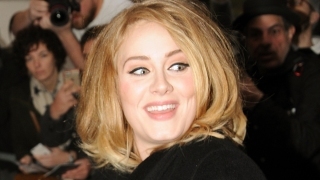 Nielsen Music said Monday that Adele's comeback track sold 1.11 million digital songs, setting a new record. Flo Rida's "Right Round" previously had the record for most downloads in a week with 636,000. "Hello" also debuted at No. 1 on Billboard's Hot 100 chart this week. It is Adele's fourth No. 1 on the chart following "Rolling In the Deep," ''Someone Like You" and "Set Fire to the Rain." "Hello" is the first single from Adele's third album, "25," to be released Nov. 20.